In this new game from EmperorS4, players are trying to protect the planet from rogue robots – that used to defend our own planet. 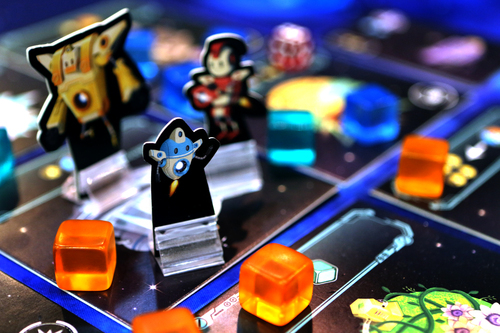 The game board is made up of a 3×3 array of planet tiles, and on these tiles, the three active Planet Defenders are found (these are the good robots). The three double sided control tiles are placed on the table. There is a deck of 20 Robot cards – these are the ones attacking you – which are dealt into 4 equal stacks and placed facedown at the edge of the planetary card array. A deck of technology cards is shuffled and 4 cards are placed face-up next to that deck. Finally, each player takes his own player board and gets 5 Battery cubes next to it. On a turn, players may choose to either take actions or to rest. If they rest, they do nothing other than refill their batteries up to a full supply of 3 Battery Cubes. If they choose to take actions, they may take 1 or 2 “Main Actions” as well as an optional “Extra Action”. A Main Action has two parts. First, you choose one of the three control tiles – each one corresponds to one of the planet defenders – and pay to use it. It costs one Battery cube if this is the first Main Action of your turn, two Battery Cubes if this is your second Main Action. You place the cubes on the card to show that you have paid; this also means you can only activate any Planet Defender only once in a turn. You move the designated defender exactly the number of spaces depicted on the card you chose. Each planet tile can only hold one Defender at rest, though you can walk through an occupied tile to get to an empty one. Second, you activate the ability of the planet tile where your movement ends. The action is found at the bottom of the tile. These generally allow you to gain or convert battery cubes and/or the three different colors of Energy Cubes (Blue, Orange or Green). If you choose to take Actions, you must take at least one Main Action. It is your choice whether to take a second Main Action (note that this costs double as well). After your Main Actions are done, you can take an optional action – you have 2 choices here. You can upgrade a Technology – this means you acquire a Technology card from the table in return for the cost in cubes printed at the top of that card. These cards give you additional benefits depending on what type of planet you’re on or which robot you chose to move. The effects of the Technology cards are stackable so that if you have multiple cards, you can add all their effects together. You can also catch a Robot as your optional action. If you ended your movement on one of the outer perimeter planets (i.e. anything but the center), you can then catch whichever Robot is on the pile closest to your Planet Defender. Each Robot has a cost, found on the left side of the Robot Card which must be paid. This card is then placed next to your player board, and most of the give you a one-time bonus which is taken now. After the Main and Optional actions are done, all the paid Battery cubes are placed in the supply and any Control cards that were used this turn are flipped to their opposite side. Also, a player must discard down to 5 Energy cubes (Blue, Orange, Green) total. There is no limit to the number of Battery cubes. The game continues until two of the four Robot card piles are depleted. Then, play continues until all players have had the same number of turns, and then the game ends. Each Robot card has a VP bonus in the upper left corner. You then score 1/2/3/4 VPs for having 3/4/5/6 different types of Robots. Finally, you score 1/2/4/6 VPs for 2/3/4/5 Technology cards. The player with the most VPs wins. Tiebreaker goes to the player with the most Energy cubes remaining. 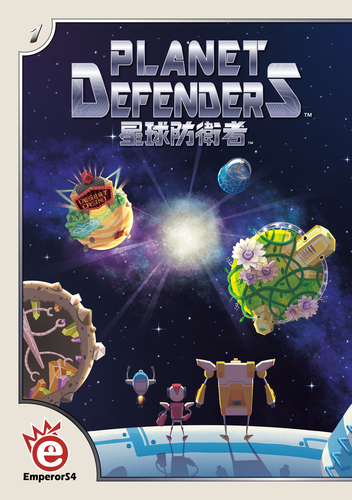 Planet Defenders is an interesting resource collection game. Despite its space theme, it is really just a game about collecting the four different types of cubes and then converting them into stuff (Technology cards or Robot cards). There is an added layer of strategy with the Planet Defenders. First, you have to manage your Battery cubes to be able to move them to the right places. You also have to choose when to spend the extra Battery cubes to take an additional Main Action on the same turn. If the Control cards line up nicely, it might be worth it. However, you need to have at least 3 Battery cubes during the turn to be able to take two actions, and it might make an Rest turn come up more rapidly. The Technology cards provide you with valuable powers, but you can’t spend all of your energy on them because you will also need to collect Robot cards to score points! The bonus points for the Technology cards is decent, and it is higher than for the Robot cards, but it’s probably not enough to win. Always keep a close eye on the status of the Robot stacks. The game can come to an abrupt and quick end if people are able to close out stacks in succession. 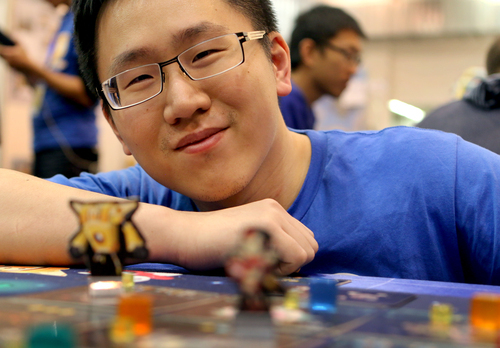 Once two stacks are down to their last one or two cards, you need to play every turn like it might be your last – as three Robot cards could be taken between your own turns. The components are nice – thick cardboard tiles and nice acrylic translucent cubes. 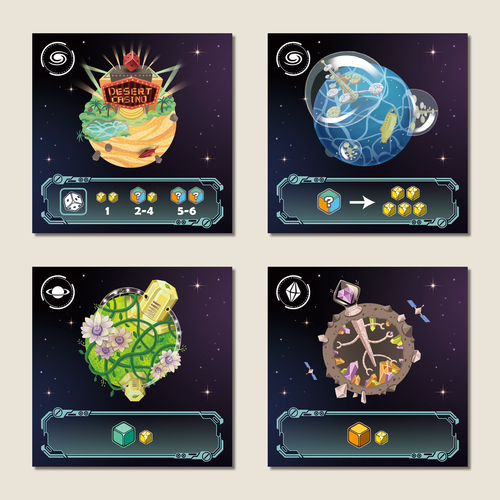 The artwork of the planet tiles is well done, and the layout of the cards is easy to read. Iconography is also easy to parse. We pretty much didn’t the rules in our first game as we were able to figure out what all the cards did from the icons. This is another solid game from EmperorS4 (also did Burano and Jungle Rumble in the past), and Round House is very high on my anticipated list for this year’s SPIEL fair. I thought this was decent but probably best with two players. Three might be OK. With four there was very little chance to plan anything.